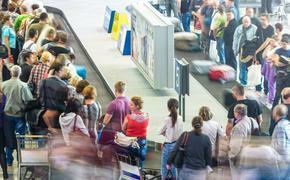 Top selling travel agencies participated in the eighth annual US Airways Vacations Scavenger Hunt in Las Vegas last week. The 30 agencies that sold the most through US Airways Vacations from Nov. 15, 2013 to Aug. 15, 2014 were selected to compete for $15,000 in shopping gift cards and air travel, each sending one representative. The agents were grouped into eight color-coordinated teams, with several travel writers helping out along the way. For the first challenge, teams participated in a slot tournament at the Riviera hotel after a satisfying breakfast, madly pressing buttons to rack up the points over the course of 10 minutes. One could say this tested their stamina and dedication. The winning team had one member crack 18,000 points. Next, agents were introduced to the new and improved Tropicana Las Vegas, which completed a renovation in 2011 that included South Beach-style rooms and suites, improved public spaces, new restaurants, a revamped pool area and the Nikki Beach Night Club. After a tour of the property, agents participated in their second challenge: the making of a room. That’s right; agents became housekeepers during this challenge. Naturally, those who paid the most attention to the rooms of Tropicana during the tour had an advantage. Teams were given 45 minutes to convert a stripped-down room into an exact replica of the guest-ready rooms at the property. And I do mean exact. The exact number of coat hangers had to be hanging in the closet. Certain items needed to be on the bedside tables. The beds had to be made a certain way. The correct number of pillows had to be set on the beds. The bathroom and shower had to have the correct numbers of amenities and towels, placed in the proper positions. It was not only challenging, but it also gave you an appreciation for what housekeepers do day in and day out at hotels. Only one team got everything correct by the time of the inspection. Most teams were a couple minor tweaks away from getting 100 percent. Last but not least, teams were tasked with making a 30-second promotional spot at the LINQ Promenade. Agents donned shades and props to get into the Vegas mood. Heck, one team member really got into the mood, stripping down to his boxers with a couple of female agents by his side. The second and final day was when the real scavenger hunt happened. Interestingly enough, the scavenger hunt took place in Downtown Las Vegas, not on the Strip. Downtown Las Vegas has been the source of revitalization efforts by organizations such as Downtown Project, which has invested $350 million in real estate, small businesses, education and tech startups, owning and/or investing in more than 300 businesses and creating nearly 1,000 jobs in the last couple years. For the scavenger hunt, agents had to answer 13 questions about the history of Las Vegas and Sin City today. Some questions could be answered via smartphones, while others had to be found and/or photographed in the downtown area. This ranged from finding items at Downtown Project’s Container Park to taking a group photo next to $1,000,000 at a local casino to discovering the former Vegas hangout spot of famous director Busby Berkeley. As you can imagine, this involved a lot of teamwork (and a lot of running around). At the end of the challenge, teams gathered for lunch on Fremont Street, chatting about the adventure before the final challenge: making a cocktail from scratch. Teams gathered around as couple of bartenders demonstrated the correct way to make a cocktail. Then, teams were tasked with coming up with their own to present to two judges in 30 minutes. Each team’s table had a different type of liquor. Liquors ranged from cherry to peach to—to the chagrin of one team—jalapeno (the judges did their best to hide their feelings about each cocktail when sampling them, but, naturally, the jalapeno drink forced a grimace from one of the judges). The winners were announced at Wynn Las Vegas this year. 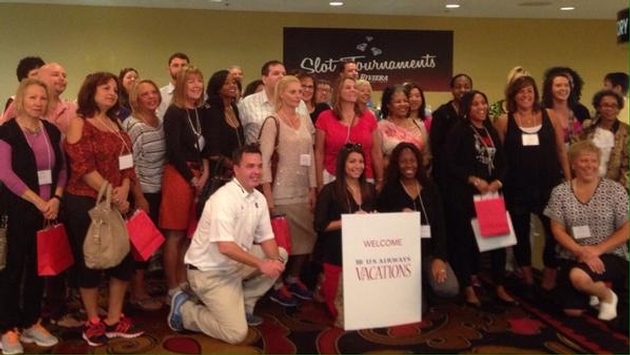 While agents sipped cocktails and had dinner at Lafleur, representatives of the Las Vegas Convention and Visitors Authority (LVCVA) and US Airways Vacations thanked them for their hard work, went over the winners of each challenge and showed the promotional spots. The winning team was the Red team.